Our engineers are experienced in all versions of Windows, Mac OS and Linux and in computer hardware and components. We can also look at your smartphone, sat nav, kindle or other gadgets that you might be having trouble with. All work is usually carried out on site, while you wait, so we can get you up and running as quickly as possible. We will arrange a time and date to visit at your convenience which includes evenings and weekends. We like to talk in plain English, so we do not confuse you with technical terms. We will keep you up to date throughout the process so you know exactly what is happening. So whatever your computer problem, please contact us to see if we can help. These are some of the typical IT support issues we deal with - if anything is not listed, just contact us. Virus and spyware attacks are becoming more prevalent and more serious. Modern virus' can trawl though your computer looking for passwords, credit card details, banking information and email addresses to send itself and spam to. It can log what you type into your internet browser and allow hackers into your computer to use your internet connection. Your computer may start with false Internet Security Tool software demanding payment for removal. Our engineers are skilled at finding and destroying all types of viruses, spyware and other malware and repairing any damage it may have done to your system. We can also advise you on the available anti virus and firewall software, so you have protection from any further infections. If you have a hardware or software problem our engineers can help you out. Perhaps you PC doesn't start or certain programs like email are not working correctly. We can identify the problem on your computer or laptop and, if necessary, replace any faulty components or fix the program that is causing a problem. Perhaps your computer is underpowered for the tasks you are trying to do. We can upgrade your memory (RAM) or hard drive or other components to make your computer run more effectively. If you feel it is the time to replace your computer, we can help you source a replacement using our experience in dealing with many of the suppliers of PCs, Laptops and Macs. We can also setup, configure and get your new computer running, making sure that all your files, email, programs have been transferred over. We can also make sure that all your data is safely destroyed on your old hard drive, so it won't fall into the wrong hands. Are you having trouble with connecting to the internet? Is email not sending or receiving? We can check your internet connection to see if there is a problem there and liaise with your Internet Service Provider to fix the problem if necessary. If the problem lies within your home or office or on your computer, we are experienced in identifying where the internet problem may be and getting it fixed as quickly as possible. If your internet is running slow, we can run diagnostics to determine your true broadband speed or check your computer and internet browser to see what is causing the problem. Homes and small offices these days increasingly need the use of a wireless or wired network to share internet/broadband connections, files, music, pictures and printers. A wireless network allows you to use a laptop, netbook or smartphone around your home or office without any wires and while other computers may be using the network at the same time. We can synchronise your smartphone with your computer so your emails, contacts, calendars, music and photos are available on both. We can source, supply and install wireless routers and configure them with the latest encryption techniques and connect your computer, laptop, netbook or smartphone to use the internet around your environment. Where wireless networking is not an option, we can advice on other solutions, such as Homeplug-Powerline Adapters which use your electric circuit for your networking and internet needs. Computer Support can also supply, install or configure a Server, which will allow you to have files and data in one place to be shared across your network and also be securely backed up. We can also install and configure Remote Access, which will allow you to access your desktop from anywhere with an internet connection. Are you moving house or wanting to get broadband for the first time or fed up with your current Internet Service Provider (ISP) and want to change? Not sure which broadband packages are available? Perhaps you've already ordered a broadband service but aren't sure how to set it up? We can advise, install and configure broadband to your home or office and get you connected so you can get going on the things that you need to do on the internet. Computer Support can guide you through set up and help you get the best from your broadband service. Get in touch today to see how we can help you get the best from the web in your home or office. We can also liaise with your Internet Service Provider when there is a fault that we have identified. No reason for you to get upset with call centres, helplines or technical support. Computers get slower and slower with age. We can optimise your system, removing anything affecting performance and reconfiguring your computer to get it running as quickly and efficiently as possible. We recommend that your computer should be checked at least once a year. We will check for unnecessary software, clean out temporary files, install critical updates, check optimum system settings, check internet security software, scan for any malware and viruses and get your computer running as effectively as possible. Do you store important files, photos, music or emails on your computer? It is important to make sure that this data is backed up should disaster strike and your computer is not operable. We can advise on what backup solution is best for you and get it installed and configured quickly to give you peace of mind. If you have lost any important files, we can also provide a recovery service to restore those deleted files. Conversely, we can also safely erase data from old computers, so they may be safely disposed of or recycled without your data falling into the wrong hands. If you need any advice on any IT issue, we can provide it. Is there an administrative process that you find cumbersome and feel that software or technology would improve the situation? Do you need help in working with Word, Excel or other programs? Our engineers are skilled at providing IT solutions for the home and office having had many years of experience working in IT departments in many different aspects of IT and computing. 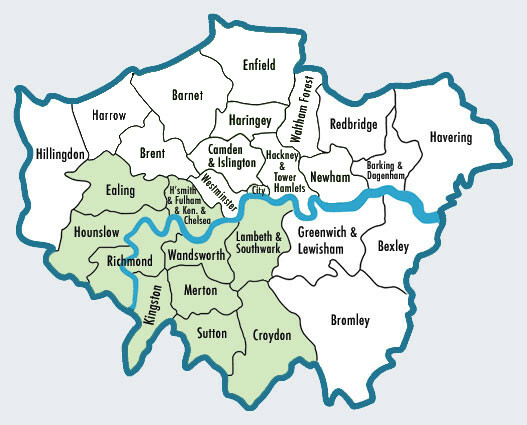 Roll over map to view areas of London served by our team (shown in green). We currently serve most of London and the surrounding areas. Please go to the bottom of our rates & locations page for a full list of Postcodes covered. If yours is not listed, please contact us to see if we can visit you. Thank you so much for sorting out our sick PC so quickly, we're really grateful. Thanks. PS - I gather you helped Richard out - he and I have recommended you to other folk so I hope you're not getting too too busy! Thank you for heading me in the right direction. Thank you for replacing my hard drive and at such a reasonable rate. Just to say that my computer is FAR better now that you have attended to it. It is faster and I haven't had any of the problems that I was having - no error messages, no instructions to shut down, no freezing out, and no case reversal in email. So thank you. Many thanks for your visit last Thursday and for arranging the purchase and installation of the printer. See you in the future. Best wishes. Thank you for your clear instructions. I have successfully de-installed Norton and installed Microsoft anti-virus protection. Another IT milestone for me achieved! Amazingly, I have followed your instructions and repaired it - it seems ok. Thanks! Will try to remember what to do next time. Thank you so much for coming to sort my internet woes out for me. Very many thanks. Won't hesitate to call you if I need any more computer work here. Thank you again so much for coming so promptly the other evening. It was very much appreciated. Just to let you know that my old machine is running a lot better than it was. Thanks very much. Thank you for helping Angela out with her computer. She said you were very good at explaining things without being over complicated. The computer is working perfectly. I don't know what you did last time but thanks very much.